Kitchen Table Bakers: Our mother, one of the great home kitchen bakers, used to say, if you use only the highest quality best tasting ingredients you always end up with something delicious and nutritious. 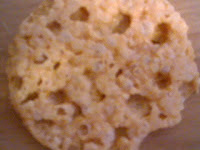 Debbie at Kitchen Table Bakers sent me a box of Aged Parmesan Crisp.. 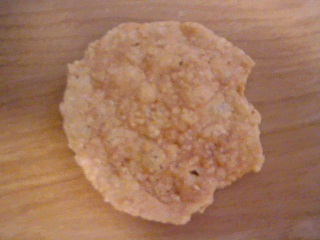 The crisp is made entirely of cheese! A natural Decadence. Wheat, Gluten & Sugar Free. the Box NET WT is 3 oz. This crispy cheese crisp is Sooo ... Delicious! I'm a cheese fanatic. I have been told on many occasions that I'm a rat because I eat so much cheese. These are so devilously GOOD! 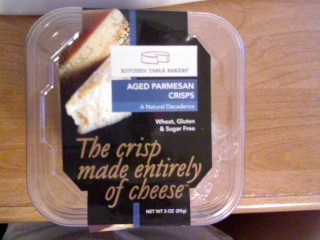 I could seriously replace chips with these cheese crisp! (I don't recommend this) Each bite you can taste the freshness, the grease and the crunch. Oh so good! You can see the big air pockets where the cheese got hot. You can taste the yummy aged Parmesan cheese in each and every bite. Kitchen Table Bakers had many flavors for all kinds of taste buds such as.. Sesame, Rosemary, Flax Seed, Garlic, Italian Herb, Jalapeno, Everything, and Aged Parmesan MINI crisp. ♥ I receive no monetary compensation for this review. I was provided Cheese Crisp to try and give my honest opinion.